What Does PEEK Dental Materials Offer Dentists & Professionals? How have PEEK dental materials impacted dentistry? Medicine is rapidly incorporating polymers into its many disciplines, and among those polymers, PEEK is one of the most capable. In the dental field, PEEK is the leading high-performance polymer used in dental prostheses and it has potential in implants, where it possesses many advantages over metal devices. This has become even more apparent since the widespread adoption of CAD and CAM technology. With these technologies, PEEK dental materials can be fabricated in a limitless variety of shapes. PEEK is most often used as the matrix for a dental device and is needed in precision attachment cases. It is particularly useful in both removable partial dentures and in full dentures, as well as over dentures. PEEK is an important material in implant telescopic bars, in both crowns and bridges (posterior and anterior) and in any suprastructures that are mounted via screws. In short, there are many dental applications where PEEK makes an ideal material. But what about PEEK makes sense for the dental field? Excellent biocompatibility – Even after years of use, there have been no signs that PEEK is a threat to biological tissues. It is completely inert and is non-cytotoxic, so it will not react to saliva or mucus. There are no cases of PEEK producing an allergic reaction, and it is also highly resistant to corrosion. In all, PEEK may be considered perfect for use in the body and will serve admirably in a long-term role. Metal, in contrast, can be an allergen for many people upon exposure. More comfortable than metal components – PEEK dental materials are extremely light, so patients can manipulate them without strain or fatigue. PEEK also produces little abrasive resistance, so it will not irritate tissues in the oral cavity. A standout property of PEEK is its very low thermal conductivity, which makes it a preferred choice in demanding environments. This low level of thermal conductivity ensures no heat is trapped around the dental device, which could produce noticeable sensations and discomfort. PEEK’s mechanical properties allow it to reliably act as a replacement for teeth as a temporary or potentially permanent denture. The wearer can open and close their jaw, chew and swallow with no resistance from the PEEK components. PEEK also provides superior shock absorption capability, which facilitates frequent chewing and talking without strain. Finally, PEEK does not alter a user’s sense of taste. It is completely neutral in this regard, which can’t be said for metal. Users of metal dental devices can be bothered by a constant metallic taste, and in some cases, this can be distressing. People wearing PEEK dental components are less likely to consider the dental device a foreign body, compared to metal. Metal cannot match PEEK in comfort. Metal devices regularly have to be modified or changed out due to abrasive injuries, fatigue or overall discomfort. PEEK mitigates these concerns. Durable and mechanically fit for the oral environment – PEEK, again, is utilized in some of the most demanding applications possible. It maintains its physical properties at stress levels far beyond what is experienced in the oral cavity. The machining process will not adversely affect PEEK, either, and its mechanical properties remain intact even after extensive working. PEEK’s widespread use in medicine is, in large part, due to its modulus (stiffness). It is nearly identical to bone in flexibility, so it can be expected to perform in similar fashion. This combination of durability and ideal modulus means PEEK components offer unsurpassed reliability. Aesthetically inconspicuous – Patients are concerned with both comfort and aesthetics. PEEK clearly delivers on the former, but it also provides better aesthetics than metal components. PEEK can be modified to appear identical to dentation and gingiva, and PEEK will not harbor plaque deposits or stains, so it will not change in appearance over time. Can be built to a perfect fit – With CAD and CAM assistance, PEEK dentures, abutments, crowns and bridges, as well as the matrix that supports them, can be custom fabricated to a particular patient. 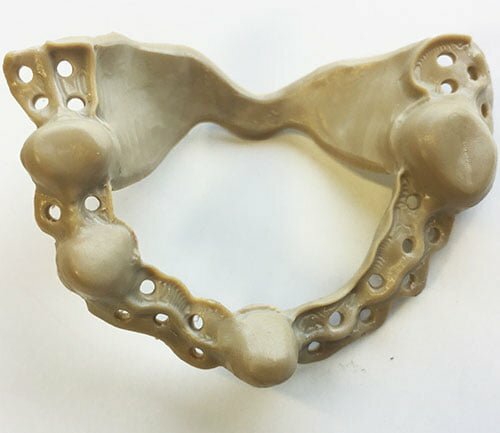 Precision fabrication uses 3D imaging of the patient’s oral cavity to generate this perfect fit, so the result is a comfortable, durable and long lasting solution. Although PEEK components are found in many medical disciplines, it is, perhaps, used to its greatest extent in dentistry. When compared to similar metal components, there is no contest. PEEK provides everything a patient, and their dentist, needs from a dental device.